Regular operations of the Prairie Dog Central commenced on Sunday July 11, 1970 on the CN Cabot Subdivision. The train operated out of Charleswood from Searle (near Elmhurst and Ridgewood) using a tiny particleboard shack as a station. In the first year of operation, the train ran three 58 km. trips (36 miles) on Saturdays, Sundays and Holiday Mondays at 10:00 a.m., 12:30 and 3:00 p.m. There were only 3 coaches in our train set at that time – coach nos. 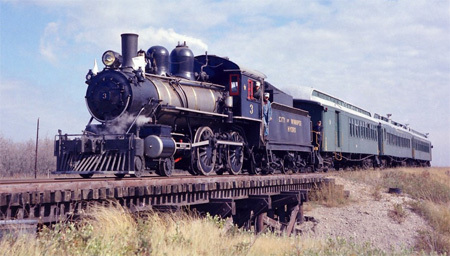 106 and 107 were added in subsequent years (1974 and 1972, respectively), and were obtained from the Greater Winnipeg Water District Railway through a trade for an ex-CPR steel coach that had been donated to us through the efforts of another founding member, the late Wilmer Ferguson. The train ran to Cabot, the end of what was formerly CN’s Harte Subdivision. At Cabot, the engine was run around the train through the passing track and ran backwards pulling the train to Searle. In 1971, operations were cut back to Sundays and Holiday Mondays because of poor crowds experienced on Saturdays in 1970. Departure times remained the same as in 1970. The train, however, was limited to running to West Winnipeg (just south of Headingly) at CN’s request, a distance of about 29 kms. (18 miles). The train operated until Sunday September 19th, 1971. In 1972, further operating changes were made: the train operated only two trips per operating day, with departures at 12:30 p.m. and 3:00 p.m. Holiday Monday operations were discontinued due to poor crowds on those days. The train operated until Sunday September 24th, 1972. This schedule of two trips each Sunday continued through to the end of 1974, although there were a couple of occasions (e.g. Labour Day weekends) when a third trip was added on account of crowds. In 1974, the Society was advised by CN that the Cabot Subdivision was being abandoned, and that the Prairie Dog would no longer be able to operate on that line. Sunday September 29th, 1974 was the last trip the train made on the Cabot Sub. During the winter of 1974-5, arrangements were concluded with CN for the train to operate out of the St. James Station on the Oak Point Subdivision to Grosse Isle. Operations continued on the Oak Point Subdivision with the two Sunday trips starting at the end of May and finishing on the last Sunday in September. After 1979, the departure time for the first trip was moved to 11:00 a.m. During these years through to the end of the 1996 season, there was no variation to the operating schedule. Charters had been run as far back as 1971, although these were sporadic until the late 1980’s. In the early 1990’s, charter work picked up significantly, and by 1996 the train was being chartered 10 times per season or more. Because of the sellout crowds that became commonplace during July and August since the train began operating from St. James, efforts to obtain another coach resulted in the acquisition of two ex-Algoma Central steel coaches through a grant made by The Winnipeg Foundation. One coach was made operable in July 1980, and was used for the next ten years as coach #101. Because of the condition of the two coaches when acquired, the poorer of the two was used for parts. Owing to its size and weight, (along with its seating that was limited to about 45 people), it became part of a trade with CN for a hopper car that was needed for coal storage. The coach was then donated by CN to the Children’s Museum at The Forks where it resides today. In 1980, the first of what has become an annual Fall Supper charter was organized. The Fall Foliage trip to Grosse Isle was first run on Saturday October 4th, 1980. This proved to be so popular that a second similar trip, called the Harvest Special, was added in the late 1980’s. This trip was run to the Hitch’n Post. Since the Prairie Dog began regular operations in July 1970, it had been stored at CN’s East Yard located in downtown Winnipeg. In 1987, the Society was advised by CN that East Yard was being closed to make way for the development of The Forks area. During the winter of 1987-8, the train and other equipment was stored at the Greater Winnipeg Water District Railway. No. 3, however, found its way to Canada Safeway’s Grocery Warehouse after an arrangement had been made following a public search for new quarters. 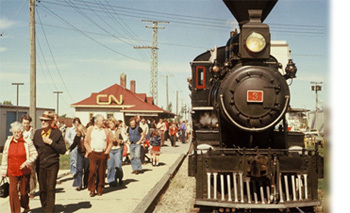 In early 1988, arrangements were made with CN for the train to be stored and maintained by the Society at Transcona Shops. Operationally, this meant that the train was stored and serviced at Transcona Shops. During the winter months, No. 3, one of the coaches and one of the service cars were moved into Safeway for winter works restoration and maintenance. These arrangements with Canada Safeway and CN continued until October 1998 and June 1999, respectively. In June 1996, the Society was advised by CN that the Oak Point Subdivision was being abandoned and that the train could no longer be operated on the mainline after the 1996 season. This meant that operations could not continue. The train last operated out of St. James Station on Sunday October 6th, 1996 on a special charter. From that time forward, the Society turned its complete attention to the matter of fund raising and finding a new home for the Prairie Dog Central. 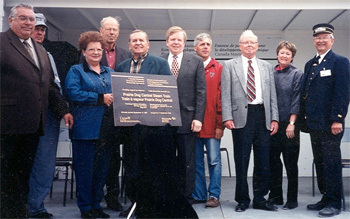 Between October 1996 and November 1998, a major fund raising drive was undertaken in an effort to purchase a portion of CN’s Oak Point Subdivision and establish a new operating base. During that period, a local farmer, Brian Roche (who was acquainted with Society member Peter Turanski), offered sufficient land at mile 9 on the Oak Point Subdivision for the Society to construct a storage/maintenance building, along with a wye and related trackage. Work commenced following the November 1998 confirmation that the Province and Federal Government – through the Economic Development Partnership Agreement – were contributing $600,000 to the project. The City of Winnipeg, through Winnipeg Hydro, contributed $100,000. Because the Society had already raised nearly $600,000 itself, the announcement enabled the sale of 16.5 miles of the CN Oak Point Subdivision to be finalized, and the necessary engineering and construction work to begin. 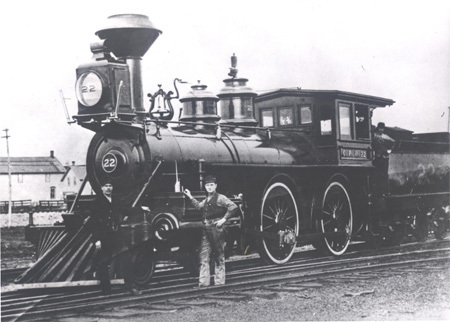 At that time, as part of the overall construction work, arrangements were also made with a farmer in Warren to construct a wye for turning the locomotive at Warren, the turnaround point for regular excursions. Following the two season hiatus, the Prairie Dog Central re-commenced regular public operations on Saturday July 3rd, 1999, and the official grand opening for the new operation took place on Saturday September 11th, 1999. Part of the re-location project included moving the CN St. James Station. Because it was declared a historic structure in 1991, application to acquire and move the Station had to be made through Parks Canada – Heritage. The approval process prevented the Station from being moved until February 2000. During the construction process, the necessary operating licensing application was made to the Department of Highways & Transportation. Because the PDC is now a short line railway, it falls under Provincial jurisdiction. Our operating license was granted in June 1999 by The Motor Transport Board following the necessary review process.